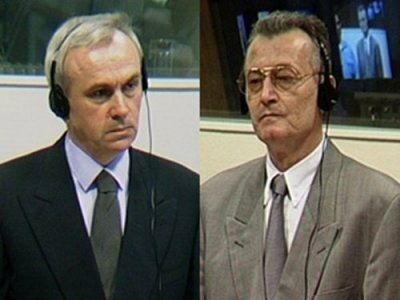 On 30 May 2013, Trial Chamber I of the ICTY rendered its judgement in the case of The Prosecutor v. Jovica Stanišić and Franko Simatović acquitting by majority, with Judge Picard dissenting, both accused. Stanišić was the de facto and, from 31 December 1991, the de jure head of the Serbian State Security services, the DB. Simatović worked under Stanišić at the DB in various capacities, most notably as the head of the Special Operations Unit. Both accused were charged with participation in a Joint Criminal Enterprise and for having planned, ordered and/or otherwise aided and abetted the planning, commission and/or execution of crimes by the special units within the DB and other Serb forces. The judgement is the latest from the ICTY to have refined the elements of aiding and abetting. In contrasting aiding and abetting liability with JCE, the Appeals Chamber in Tadić held that the acts of the aider and abettor must be “specifically directed to assist, encourage or lend moral support to the perpetration of a certain specific crime”. The requirement has been subsequently adopted as an element of the actus reus of aiding and abetting in the jurisprudence of the Tribunal, including in the cases of Vasiljević, Blaskić, Simić and Orić. Similarly, the ICTR has also endorsed specific direction as an element to be proven in order to establish an individual’s liability for aiding and abetting. That the accused aider and abettor’s conduct was specifically directed at the commission of crimes need not be expressly proven; it will often be an implicit part of the finding that the accused provided practical assistance to the physical perpetrators which had a substantial effect on the commission of the crimes. The Appeals Chamber in Blagojević and Jokic, having found that the Trial Chamber did not err in holding that Jokic’s assistance to the VRS had a substantial effect on the commission of mass executions at Srebrenica, did not additionally proceed to verify whether the assistance in question was specifically directed at the commission of the crimes. The recent appeals judgement in Perisić both endorsed and qualified the finding that specific direction can be demonstrated implicitly through analysis of the substantial contribution requirement. The Appeals Chamber held that specific direction must be considered expressly where the relevant acts of the accused aider and abettor are remote from the relevant crimes, for example, temporally or geographically. Furthermore, in cases where the accused aider and abettor provided general assistance, which could be directed at both lawful and unlawful activities, the Prosecution must prove that the assistance in question was specifically directed to the crimes of the physical perpetrators. In doing so, evidence regarding the accused’s state of mind may serve as circumstantial evidence from which the chamber could infer that the accused’s assistance was specifically directed at the commission of crimes. Stanišić and Simatović adopts the approach of the Appeals Chamber in Perisić. The Chamber examined whether the general assistance provided by the accused to a specialised unit of the DB under their command as well as to other Serb groups was specifically directed at the commission of crimes by those groups. The Chamber found that the accused’s financing, training, supplying, organising and supporting of the groups in question was not specifically directed at the commission of crimes. The crimes occurred in the context of military operations and the assistance of the accused may have been directed at establishing and maintaining Serb control over the localities where the crimes occurred. Judge Picard dissented, finding, inter alia, that the evidence established beyond a reasonable doubt that the accused intended the commission of crimes by the physical perpetrators. Had the majority of the Chamber also reached this same conclusion, it is possible that Stanišić and Simatović could have been held responsible for aiding and abetting, their mens rea serving as circumstantial evidence from which the Chamber could infer that they specifically directed their assistance to the unlawful activities of the organisations in question. For a summary of the Stanišić and Simatović Trial Judgement, click here. For a summary of the Perisić Appeals Judgement, click here.